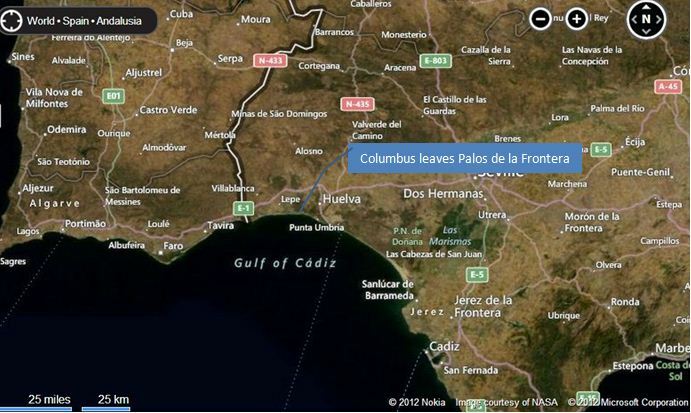 On the evening of August 3, 1492, Christopher Columbus left Palos de la Frontera, Spain commencing his voyage to the “Indies” with three Ships (the Nina, the Pinta, and the Santa Maria) and 90 men—a voyage that changed the world. 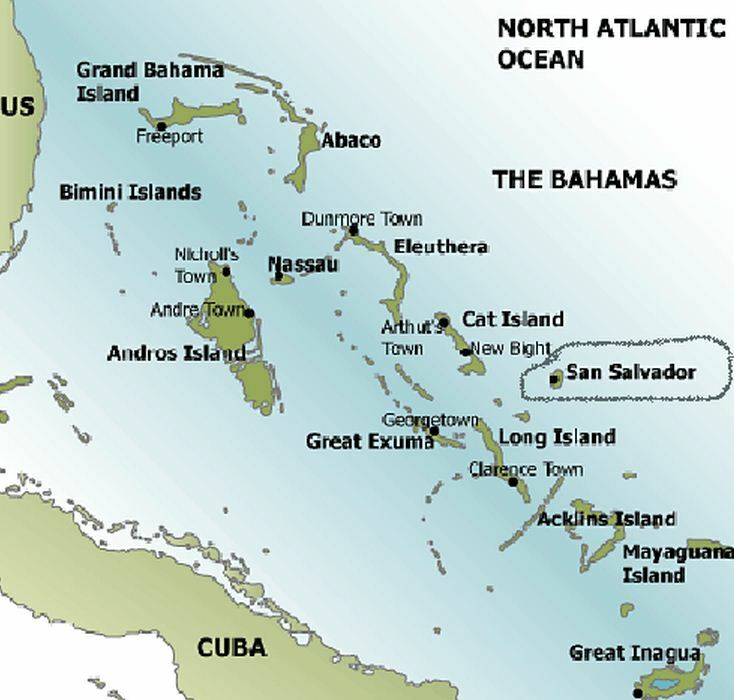 90 days later, October 12, 1492, they landed at, not the “Indies” but one of the Bahama Islands. Columbus named it San Salvador (Holy Savior). Columbus opened the way for Western Civilization and the Name of Christ into what he called “this second part of the earth.” The endowment of the Greek-Roman civilization to Western Europe and the great gift of light, Christianity, made the western hemisphere profoundly superior to anywhere else on earth. He immediately changed the lives of the Indians on “San Salvador” for ill as well as good. The good is apparent. The Taino, while peaceful, had no culture of their own. They lived off the land much as any animal. They suffered from the plunder of their neighbors, the Caribs to the south and east and the Mayan to the west. This changed for these Taino. The ill? Disease. Neither the Taino or the Europeans had antibody resistance to new diseases. It was several years before the Spanish brought small pox to San Salvador. This deadly disease ravaged the Taino and beyond. In return, the Spanish, who followed Columbus, received and spread throughout Europe new deadly forms of venereal disease. 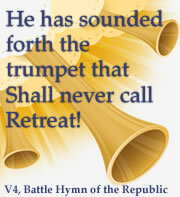 He led the way to a land (America) which would one day provide the first welcome haven to the Jewish people. You see, after Ferdinand and Isabella defeated and permanently expelled the Islamist Moors, they Commissioned and financed Columbus, a profoundly good thing. But they matched that with an equal in evil—they expelled the Jews. It is called the inquisition. 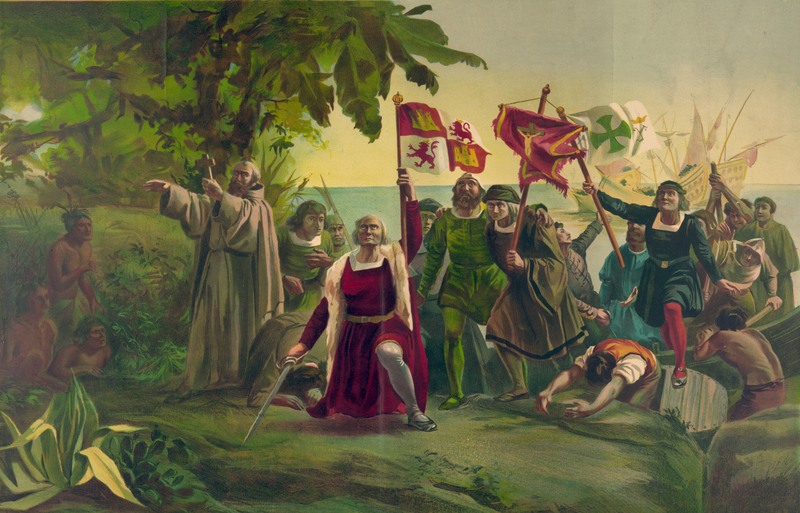 Christopher Columbus received his commission about January 1, 1492. He would need about seven month to obtain and fit his three vessels and build his crews. In early May, the decree of the Spanish Inquisition was published. All Jews had three months to leave Spain. As the tide began to turn, he was rowed out to the ship where his men waited, and assumed his first command crisply and confidently. In moments, and “in the name of Jesus,” the Santa Maria had weighed anchor, set sail, and was gliding down the river with the ebbing tide. As they reached the place where the Tinto joined the Saltés, just before emptying into the Ocean, a last shipload of Jews was also waiting for the tide. They too were leaving now, bound for the Mediterranean and lands of Islam. It is doubtful they thought of one another beyond a routine log entry. And even if they had, none of that forlorn shipload of Jewish exiles could have dreamed that the three other ships on the river were leading the way to a land which would one day provide the first welcome haven to their people. Christopher Columbus is one of the few transformational figures in history. There can be no doubt the work he set out to accomplish that August in 1492 was indeed work for the cause of Christ. 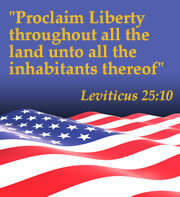 This entry was posted in Celebrating America, Christian life and service, Reclaiming and Restoring America. Bookmark the permalink.